EFC Uganda Limited (EFCUL), also known as EFC Uganda, is a microfinance deposit-taking institution (MDI) in Uganda. It is licensed and supervised by the Bank of Uganda, the central bank and national banking regulator. EFCUL lends primarily to small enterprises. The headquarters of EFCUL are located at 6 Acacia Avenue on Kololo Hill in the Kampala Central Division, about 3.5 kilometres (2 mi) north of the central business district of Kampala, Uganda's capital and largest city. The coordinates of the institution's headquarters are 00°20'12.0"N, 32°35'15.0"E (Latitude:0.336667; Longitude:32.587500). The institution opened in Uganda in June 2012 as Entrepreneurs Financial Center Limited, with one branch in Ndeeba in the Lubaga Division of Kampala. In November 2014, EFCUL was awarded an MDI banking license by the Bank of Uganda, adopting the name EFC Uganda Limited. As of December 2015, EFCUL owned assets of UGX:26.8 billion, with shareholders' equity of UGX:5.982 billion. At that time, the institution employed 121 staff. EFCUL focuses on financing micro, medium, and small enterprises. In December 2015, EFCUL received a loan of UGX:10 billion for onward lending to micro, small, and medium-sized businesses. ^ BOU (31 March 2016). "List of Licensed Microfinance Deposit-Taking Institutions (MDIs), As At March 2016" (PDF). Kampala: Bank of Uganda. Retrieved 12 August 2016. ^ Tentena, Paul (12 December 2015). "FMO supports MSEs in uganda through EFC". East African Business Week. Kampala. Retrieved 12 August 2016. ^ Globefeed.com (12 August 2016). "Distance between Post Office Building, Kampala Road, Kampala, Central Region, Uganda and Riders' Lounge, Kampala, Uganda". Globefeed.com. Retrieved 12 August 2016. ^ Google (12 August 2016). 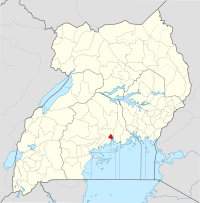 "Location of the Headquarters of EFC Uganda Limited" (Map). Google Maps. Google. Retrieved 12 August 2016. ^ a b c EFCUL (12 August 2016). "EFC Uganda: Who We Are". Kampala: EFC Uganda Limited (EFCUL). Retrieved 12 August 2016. ^ BOU (30 June 2015). "Bank of Uganda Annual Report for the Period 1 July 2014 Until 30 June 2015" (PDF). Kampala: Bank of Uganda (BOU). Retrieved 12 August 2016. ^ Lafond, Claude (31 December 2015). "Managing Director's Message". Kampala. Retrieved 12 August 2016. ^ EFC Uganda Limited (27 June 2016). "EFC Uganda Limited: Advertisement for Three Staff Positions". New Vision. Kampala. Retrieved 12 August 2016. ^ Mark Keith Muhumuza (4 December 2015). "SMEs to benefit from Shs10b Dutch government loan". Daily Monitor. Kampala. Retrieved 12 August 2016. ^ EFCUL (12 August 2016). "EFC Uganda Limited: List of Investors". Kampala: EFCUL. Retrieved 12 August 2016. ^ EFCUL (12 August 2016). "EFC Uganda: About Us: Contact Us". Kampala: EFC Uganda Limited (EFCUL). Retrieved 12 August 2015.